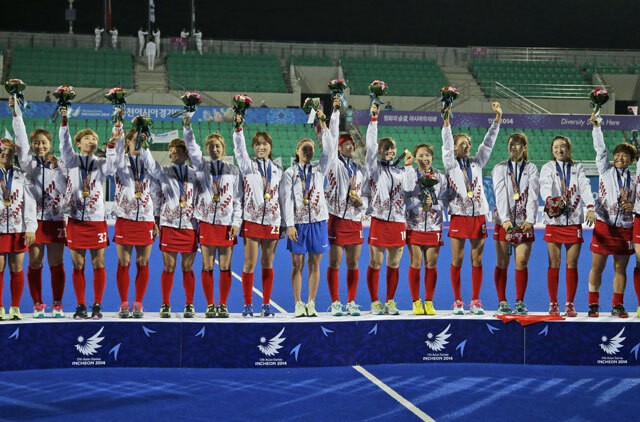 Incheon: Kim Dar-ae scored the winner as South Korea ended China’s 12-year reign as Asian Games women’s hockey champions with a 1-0 win in the final on Wednesday. Kim’s decisive goal in the 41st minute handed the Koreans the title they won four times in a row from 1986 to 1998 before China took over for three tournaments. Cheered by some 1,000 home fans, the Koreans ran into each other’s arms after the final whistle, having avenged a penalty shoot-out loss in the 2010 final at Guangzhou. The win ensured South Korea a direct entry for the 2016 Olympics in Rio de Janeiro, while China will have to play qualification rounds. South Korea’s Park My-hyun, a veteran of 210 internationals who is retiring after the Games, said she was delighted to finally win an Asiad gold. “It is like a dream for us,” an emotional Park said. “I was part of the team at the last two Games and it hurt badly to lose in the final both times. So this victory is really special for me. Park said the team had studied Chinese tactics during the competition and planned well for the final. India, who lost to South Korea in the semi-finals, defeated Japan 2-1 to pick up the bronze medal. Jaspreet Kaur put India ahead with a penalty corner shot in the 23rd minute, and even though Akane Shibata drew level in the 44th, Vanadana Kataria scored the winner a minute later. Japan were bronze medallists at Guangzhou, while India won back the medal it last gained in Doha in 2006. Indian coach Neil Hawgood said the win will boost women’s hockey in the cricket-mad country. In football, North Korea upset defending champions Japan 3-1 to win gold in the women’s football on Wednesday, avenging their loss in the final four years ago. Kim Myun-mi, captain Ra Un-sim and Ho Un-byol scored as World and Asian Cup holders Japan were totally outplayed by North Korea. The North’s players squealed with joy, some bursting into tears, at the final whistle as around 60 of their flag-waving comrades in official tracksuits hopped with delight in the stands. South Korean fans chanted support for their neighbours from north of the border throughout, many waving unification flags showing the Korean peninsula in blue on a white background. North Korea took the lead after 12 minutes when midfielder Kim stabbed home from close range following some dreadful Japanese defending. They produced a moment of true class to double their lead seven minutes after the interval, Ra latching on to a long diagonal from Jon Myong-hwa to finish with a clinical right-footed shot.